The concept that we, as human beings, are all tied to each other in some way is one that most people understand on the basest of levels. Many might not think anything of it, while I’m sure many others think the theory is without merit. To genuinely try to conceptualize the grandness of the idea though can be overwhelming. Regardless, it is often fodder for filmmakers, including Fernando Meirelles, the Brazilian director of CITY OF GOD. 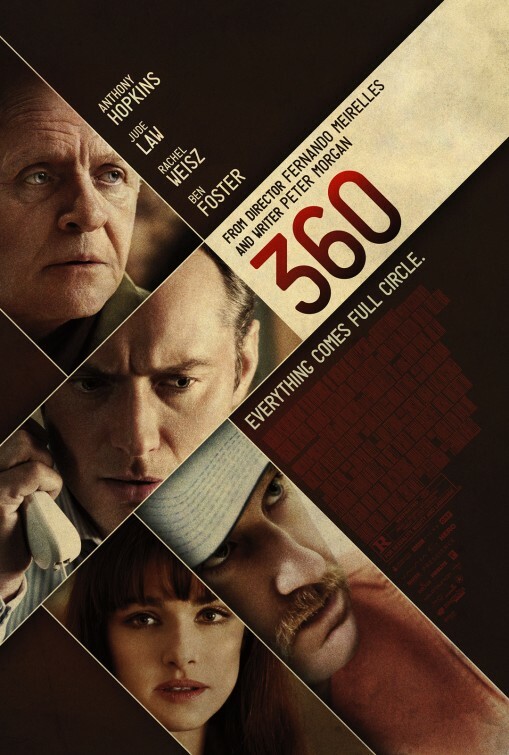 His latest, 360, takes the viewer around the world to understand that we are just living in one big global community. Who knew that such a big trip could feel so slight? Even talented scribe, Peter Morgan (FROST/NIXON, THE QUEEN) cannot revolutionize the 360 concept. The trouble with tackling this topic is that the filmmaker’s hand is shown in the first act of the film. The audience may not know precisely where they’re being led but they know that it will be from one insignificant moment to the next in an elaborate game of connect the dots. Subsequently, no attachments are made to the characters on screen and thus, very little engagement in the film is established. Gifted actors like Jude Law and Rachel Weisz (who won an Oscar the last time she worked with Meirelles on THE CONSTANT GARDENER) appear and disappear almost as quickly. Only Anthony Hopkins manages to carve out a memorable scene, with a passionate confession at an Alcoholics Anonymous meeting. And then he’s gone. Life is made up of these fleeting moments and 360 does a good job demonstrating how even the seemingly least significant of those moments, derived from chance encounters in airports or dentist offices, can lead to life altering events. It does so in such a banal and uninspired fashion though that all it truly made me feel is that I would be better off making connections with people instead of watching people make them. How many sheep would you give 360?